Raz Reid was born in Greenville SC and became a world class tennis player. He was the number 1 ranked tennis player in the South, top twenty in the United States and a two-time All American at the University of Miami. He played on the Association of Tennis Professionals (ATP) tour for nine years and met Australian wife Kerry Melville who is an Australian Open Singles and Doubles Champion, in addition to a Wimbledon Doubles Champion. Raz has always been an avid fisherman and was introduced to fly fishing while in Australia and fell in love with the sport. Since that time he has held over 20 fly rod World Records, including blue-fin tuna, arctic char, golden dorado, and giant trevally. He has won the Islamorada Spring Bonefish Invitational and been a runner-up in the Gold Cup Tarpon Tournament. 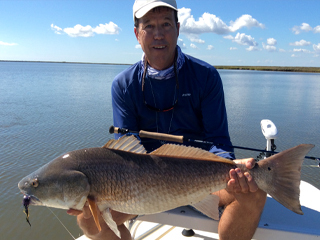 He has been a fly fishing industry insider for more than 20 years as a representative for Tibor Reels, Sage, Redington, RIO, Fishpond and Smith Optics. His championship pursuit and years of elite level tennis instruction translate very well to fly fishing and fly fishing instruction.